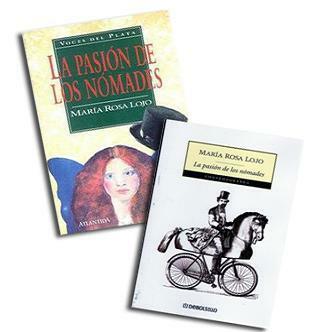 Spanish editions of Passionate Nomads. Merlin awaits me at the Anchorena lodging. Eternity has recently begun. Like a leaping of animals through a wheel of fire, like a fatal stroll over a rope of wind, poised over uneven ground, on tiptoe over an icy knife that is breaking apart at every step. Winter is a house that in its trunks keeps memories of the most ancient love, the warmth of a lap, a voice predating the word – all enclosing the sleeper in their ball of silk. La muerte que ríe, la muerte engalanada con un sombrero de borlas y vestida con traje de comunión, se sienta con nosotros a la mesa. Nos convida con chile y con aguardiente para que la eternidad nos encuentre ardiendo y la mañanita se levante con nostalgias de alcohol y de disfraces. Muerte catrina, muerte poderosa que le pone al pobre tu sombrero y regalas al ciego una guitarra de cuerdas invisibles. Muerte de la felicidad, roja como la flor de Nochebuena, los vencidos de la tierra te saludan para que los lleves a tu mesa gloriosa, y sean saciados de ira y de justicia. Laughing death, death dressed up in a tasseled hat, wearing a First Communion gown, sits down with us at the table; treats us to chilis and liquor, so that eternity may find us aflame and the mañanita may rise with nostalgia for strong drink and fancy dress. Dandified death, powerful death, you who place your hat on the poor, you who give the blind man a guitar with invisible chords. Festive death, red as the flower of Christmas Eve, the vanquished of the earth greet you, that you may carry them to your glorious table, and they may be sated with rage and justice. The word “dandified” is translated here from the Mexican catrín, -a, in popular usage generally mocking; as a noun it is often represented as a skeleton sumptuously decked out in feathers and finery. Mañanita is the poet’s deliberate play on two senses: the simple mañana of a day’s fresh dawning, with nostalgias of a night of partying; and las mañanitas, which in Mexico are the morning serenades sung to people on their birthdays. English language translation © 2008 Host Publications. Exerpt from A Bride Called Freedom. These e-mail letters were handed to me by their author herself. 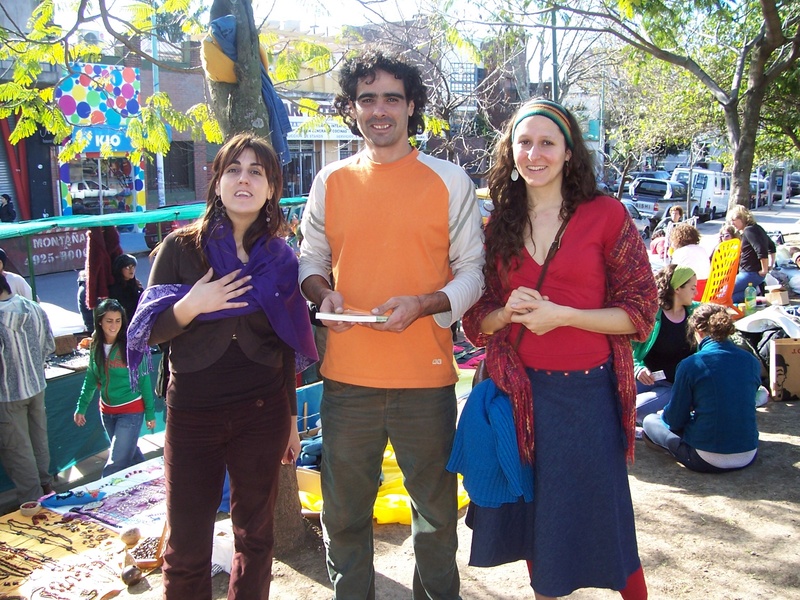 Viviana Suárez was an unusually gifted undergraduate student in a seminar I gave in the spring of 2002. She was a freshman, and would normally have been ineligible for the class before her senior or, at the earliest, her junior year. I accepted her based on these letters alone, which she presented to me in the present chaptered format. They perfectly fit our topic: the forgotten presence of women in colonial and post-colonial Latin American literature. What’s more, her manuscript constituted an original contribution to the field that any one of her mostly graduate-level classmates would have died for. Later she would show me her antique Argentine source, copied in elegant Spanish handwriting (analysis dates the ink to over a hundred years old). In her “prologue” she clarifies the circumstances surrounding this discovery; also, the existence of a poem that would seem to corroborate the story’s authenticity. Both letters and poem concern the legend of one Dorotea Bazán, who was captured by Indians in the late 19 th century. 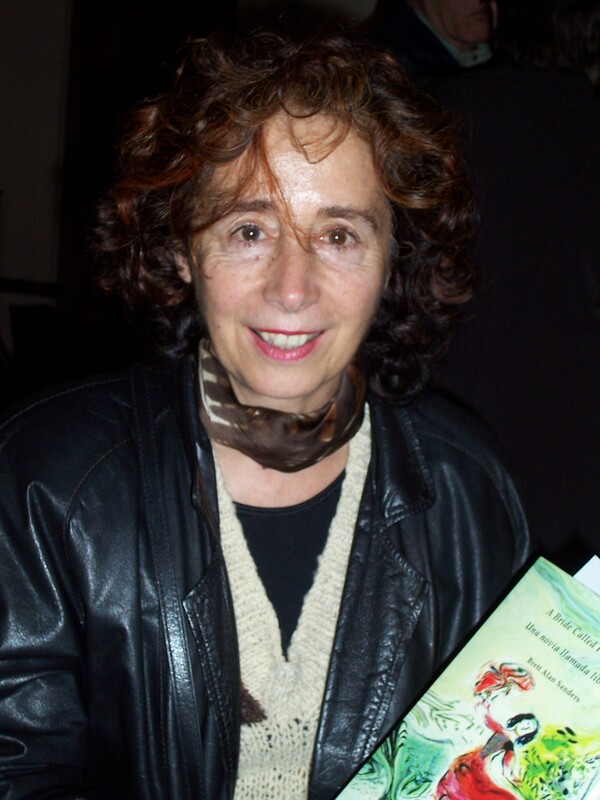 While the source itself is not clear on this, Ms. Suárez suggests that she was a descendant of poor immigrants from Galicia, one of numerous non-Castilian regions of Spain. Be that as it may, I have found the work remarkable, from the document itself to its translator’s own imaginative insertions. I do not pretend to an absolute knowledge of what is true or false here; you, my young reader, must decide for yourself…. I’ve happened on proof that she really might have existed! Can you believe it? Señor Connor’s obsession? 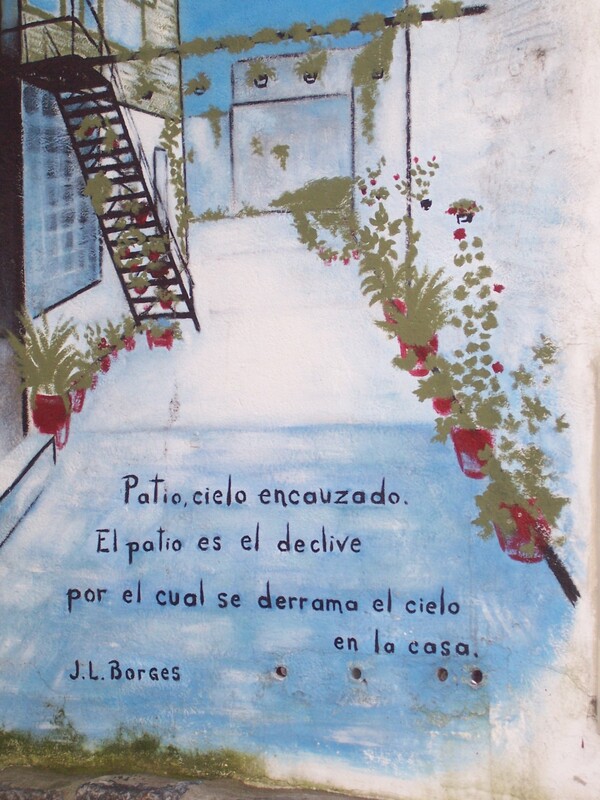 The poem he had us recite by memory in its Argentine-accented Castilian Spanish? The sultry thickness of that woman’s voice played again and again on the scratchy record our teacher’d brought home with him years earlier to help yet-future students practice their recitation? The one-act musical play that he wrote himself and cajoled the drama club into presenting before the entire school and families? God knows you can’t have forgotten, Leeza. We were sophomores then. You were his Dorotea! You sang that very song! First a chorus in Spanish: mysterious and somber, to set the proper mood. Then in Señor Conner’s own adapted English. A poetic rendition, he said, not slavishly literal or else it wouldn’t fit the guitar’s rhythm. The guitar that he played offstage, in unseen shadows, while you his musical protegée dulcetly sang. I don’t think I really thought much about her at the time. Did you? As someone who might have ever been flesh-and-blood, I mean, who might’ve actually lived. Sure, I’d remembered reading some children’s book about the Mary Jemison story back in fourth grade. North America’s own Dorotea. Miss McNamara had told us that she ended up marrying among her captors and that she loved her husband, bore him children. It wasn’t that I thought it impossible. This song of a white woman captured by Indians? Arguing years later with the Argentine captain who would forcefully redeem her for “civilization”? “Yo no soy winca, capitán,” she’s supposed to have said. “I’m not winca (or white woman) but Indian, by mystery of love.” Of course it could have been true, as Señor Connor believed but couldn’t prove. It could’ve been, sure. But the story, like our old teacher’s obsession, struck me then as vaguely childish. Like something that might’ve interested me years ago but that couldn’t compete with turn-of-the-21 st-century adulthood. Besides, he’d told us himself that the story didn’t exist in its alleged source. A problem that visibly troubled him. How pleased he’ll be with his former student when he learns that I’ve solved it! First thing when I’m back in the States, I’ll stop in on him. Meanwhile let me tell you, Leeza, my good and faithful friend, how it came to be. I owe it to my parents who allowed me the luxury of this year-long vacation between high school and university, and my paternal aunt who gave me lodging and freedom to roam in this grand metropolis where she and Papi were both raised. My aunt is a professor of literature. When I laughingly told her the story of our dear teacher’s obsession, she gave me two volumes of Lucio Mansilla’s Una excursión a los indios ranqueles [An Excursion to the Ranquel Indians] – the famous “source,” according to the blurb inside that old LP cover, of Dorotea’s story. Of course Señor Connor was right, it wasn’t there. But the narrative that I did discover absolutely (who knew?) enchanted me. Just yesterday here in Buenos Aires it’s only by the weirdest chance that I finally stumble on what, with more enthusiasm than certainty, I’ll still call “proof.” Proof? That someone might have existed? The manuscript, though apparently ancient, quite visibly delicate, is the hand-copied shadow of an almost certainly vanished original. Is it truthful history or imitative fiction? The old woman who handed it to me had possessed it in secret for as long as she can remember. When I’d whispered over a sip of the national tea (that bitter yerba mate!) of captive Dorotea’s mystery, she rose, mysteriously. She emerged long seconds later cradling those weathered pages. She said my eyes remind her of how she’s imagined Dorotea’s! It was an inheritance, she said, from her mother, who claimed to have it from a friend of Eduarda Mansilla de García, Lucio’s sister. Can there be another copy? If mine is the only one, how is it that the lyricist knew both name and story? 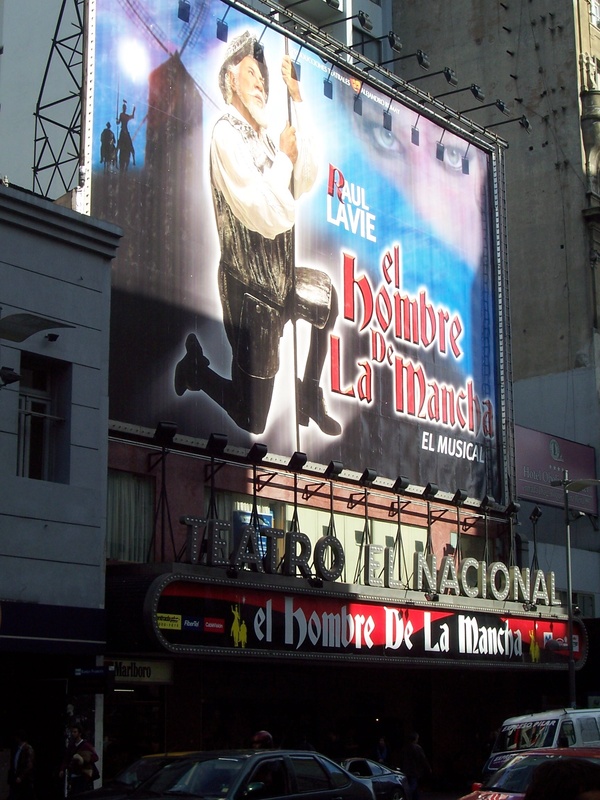 While I’m still in Argentina, I should do some digging. But do I want to know? Is it perhaps nobler to just believe with pure faith, like windmill-tilting Don Quixote? Yes: Dorotea lives! What will follow, in future letters, is her “true” history – as recounted privately to Mansilla, recorded but never published. You must imagine, my darling Leeza, why the story might have finally taken such a hold on me. This woman, whose life now presents itself in more developed form than any previous feminine narrative of these pampas, is too much to resist. But is it history, faithfully recorded, or Mansilla’s invention? Or is it in fact his sister Eduarda’s story, as-told-to or fictional, masquerading, behind her brother’s more famous name? Or is it someone else’s invention entirely? These are all questions, Leeza, whose answers I don’t pretend to know. Their clarification awaits the investigations of greater scholars than I. To me just leave the full revelation of the romance. Some portion of the story, if not its whole, has been known to more people than you could shake a stick at. In short, it relates the adventures of an idealistic old Spanish gentleman, a chaser of windmills that he mistakes for giants, a gentle don Alonso who, reading too many stories of chivalrous knights in shining armor, becomes a certain don Quixote, losing what in human society generally passes for sanity and setting off into the world to fight evil magicians and other scoundrels, to set to right the wrongs that the poor and defenseless have always suffered; accompanying him is a practical-minded peasant named Sancho Panza, who, in return for some monetary reward to beat his usual fare, agrees to be the knight’s squire. What follows here, in any case, are simply a few fragments, in the poetic form of the prose paragraph, of this reader’s impressions of that story. I hope that each paragraph, like any worthy poem, will bear reading and re-reading, and that the pondering that follows from that act will bear joyous fruit. The reality that each one encloses is a multi-leveled experience, for there is more to any reality than meets the eye. Truth is often concealed beneath the surface of an absurdity. Estimable Sir Quicksote. Whatever we call him, this knight of the rueful or sad countenance, this sorry-looking, skin-and-bones, puppy-dog face, he is there, everywhere we look, all around us. According to The Oxford English Dictionary, quicksotic sentiments: “If … our Quixotics seem foolish or extravagant.” Our foolish extravagances, then, our quixotics, or quixotries, or quixotisms, are simply quixotical. By extravagantly emulating the grand Quicksote himself, the don Quicksote of Cervantes’s novel that we may or may not have read, we become our own Quicksotes, sinking into the quicksand of our lofty, unrealizable idealisms: “Thus the Quixots of this Age fight with the Windmills of their own heads.” But to our mind quixotics is more than foolishness to be forgotten; it is a different way of knowing things, of perceiving the deeper realities that are hidden by their plain surfaces. We declare this definition boldly, without apology to this world’s wise or to the editors of dictionaries, who looking at us askance, smiling out of the sides of their mouths, are wondering if at last we would just stop quicksotizing, or quicksoting, and accept the realisms they proffer. After the evil magician Frestón’s windmill-giants, there was the Moorish knight Mambrino’s basin-helmet. Don Quixote, sworn to possess it, sighted it atop a barber’s head, where it rested because of a sudden shower; he gave chase, the barber fled, and the makeshift helmet fell to the ground. The conquering knight, making use of the masculine pronoun lo, ordered his squire Sancho to pick “it” up, and Sancho, taking the feminine pronoun la in hand, would seem to have obeyed if it were only the same “it.” This is a grammatical sleight of hand that the translator in English is always unable to convey, just as he cannot do justice to clever Sancho’s invented speech that makes of two visions one. The basin-helmet, now, whatever it had once been, is neither basin nor helmet. It is baciyelmo, a fusion of the original bacía for basin and yelmo for helmet. A word, or a world, is born. On the road to adventures, Quixote encounters a troupe of performing artists who put on their masks and act for him. He is wearing his mask, too, for all the world’s a stage, and across the stage dances my youngest daughter the princess in the role of Cinderella. She performs for him Disney’s pirouettes; chivalrously he bows; from the crowd, then, someone shouts that they are not who they represent themselves to be. Much can be said on that point, however. In one voice they answer that they know who they are. And why should we suppose otherwise? Quixote’s madness, as Van Doren writes, is but his chosen profession. What in its “materiality,” Ortega y Gasset explains, is a windmill, in its “sense,” as interpreted by Quixote, is a giant. It matters little, he writes, that we call Quixote mad, for in other times, out of a different lived experience, humanity had dreamed into being the giant, who in reality we say has never existed nor will ever exist. Likewise, he writes, the ideas of truth and justice are interpretations from measured experience, unknowable by empirical tests. For this reason, we might add, the meanings attached in Anglo and Hispanic visions to a word like democracy are so different, and its actual meaning the whole of its multiple interpretations. We might guess that it is the same with the material forms, or grammars, of every discipline; not least among these is mathematics, whose certainties, as we penetrate them, are fluid, ever changing. Algebra, as Hogben writes in his populist explication of numeracy, is but a descriptive language of the sizes rather than sorts of things in the world. Quixote, at once gaucho and knight-errant, flees to the liberation of his pampas; the woman, her movements checked, negotiates her freedom with changing captors. Around the fire she tells her story, pleading with the captain who would return her to civilization, her song echoing down to us today through another woman’s rich voice and the gentle folk strains of a guitar. By mysterious love, longing for the rawhide, sun, and grass of her Indian husband’s empire, electing to share that fate, she walks from the fire toward her desert, toward barbarism’s gate, García Márquez’s sad and innocent Eréndira in an incredible, solitary flight. Quixote stands behind her a rearguard, his lance a threat against any man who, denying that feminine will, should now make bold to follow. While the bulk of Cervantes’s novel is fat, like faithful Sancho, its spirit is lean and diffuse, like the solitary knight and his horse. The exercise of this writing has its necessary conclusion, but what might have been written, like Quixote’s quests, is unlimited; Quixote, marked in my books’ margins and my mind’s recesses by penciled notes and DQ’s, reveals himself to me forever in undreamed of epiphanies. 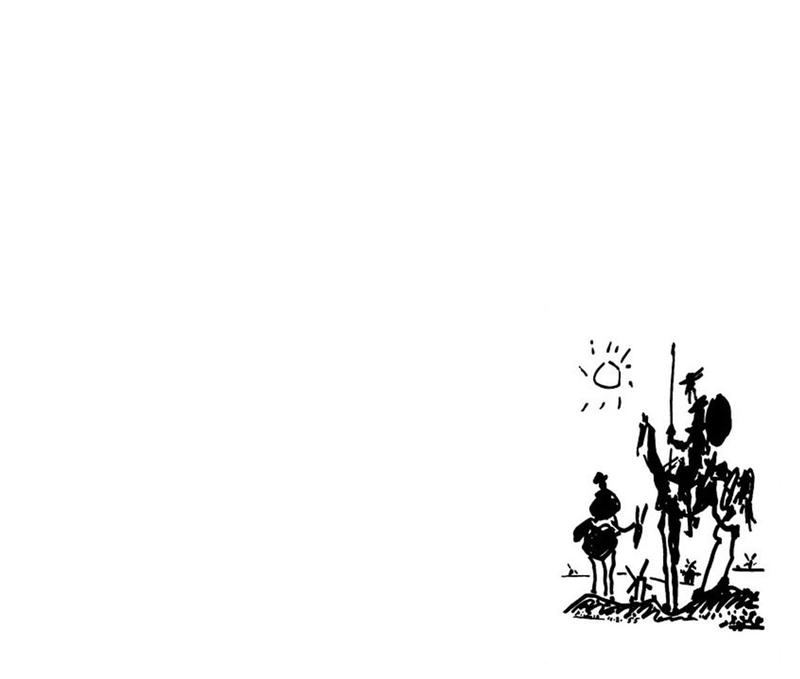 Quixote, says Sancho the Good, should rather have been a preacher than a knight-errant. But faith without works is dead, Quixote answers; we are children of what we do. Saints, like Jacob with his angel, have taken heaven by force, as I would now take it in my peerless Dulcinea’s name. I do not take it as a violent man, rashly sacking the earthly kingdom, but as a peaceful crusader and righteous warrior. Knight-errantry is both my ensign and my religion.